“Shall I read some of that fellow Byron’s poetry to you, Miss Montgomery?” he asked, picking up a volume from a side table. The look of distaste on his face at his own suggestion made Vivien chuckle and shake her head. 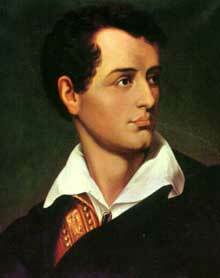 George Gordon, Sixth Baron Byron, was the hottie of the period. Russell, in Notorious Vow, acknowledges this and is rewarded by Vivien’s candor. She thinks the dramatic sweep of Romanticism that becomes full-blown in the Regency period can be dangerous for its addicts, much like Anne Elliott in Jane Austen’s Persuasion. Vivien has good reason to believe Lord Northam, who nearly ruined his life when he made a certain notorious vow, resembles the greatly impassioned, and ultimately tragic, Lord Byron. This entry was posted in Notorious Vow, Regency and tagged Lord George Byron Romantic Movement by Angelyn. Bookmark the permalink.